In honor of National Diabetes Month, please welcome my friend Paul Moyer from Saving Freak blog. Paul is going to share with us some important ways for people with diabetes to save money. Take it away, Paul! There are 29.1 million people diagnosed diabetes in the United States. In other words, almost everyone has a family member or knows a friend with diabetes. Having diabetes can be difficult physically, mentally, and also financially. A diabetic diagnosed at the age of 40 could easily spend over $200,000 on direct and indirect expenses because of diabetes. With such a heavy price tag, some people struggle to manage their diabetes because of a lack of funds. The good news is there are simple and effective ways to save money on medications, treatments, food, and all other aspects of diabetes. Having a better handle on your diabetes will reduce the amount of medication you need, which will decrease the amount you spend on medications. Managing your diabetes through healthy eating and exercise may reduce or eliminate the need for medication. Whether it is your budget or your health, saving money always starts with better management. It seems like no matter where you look, brand name items can cost twice as much as the generic counterpart. The same goes for your diabetes medications. Look for any generic choices that are available. Generic medications can be half the price of brand name. Always ask your doctor if there is a generic alternative to your prescription, or if there is another prescription that will work just as well that is generic. The generic strategy also applies to glucose testing strips. Brand name testing strips can be as expensive as $35 or $40 a kit, while their generic counterparts are usually around $10. Many pharmacists, doctors’ offices, and expos offer a multitude of samples. Doctors typically have samples of the newest drugs on the market. Not only will using these samples (after checking with your doctor of course) save you money, but it might also introduce you to a more efficient way of treating your diabetes. However, beware because once you run out of samples you may end up having to pay full price for the medication, depending on your insurance coverage. Managing diabetes can be difficult, especially when it comes to meals. One of the more important guidelines for diabetics is a healthy diet. However, sometimes eating healthy can become expensive. Always take advantage of weekly sales and coupons at the grocery store. If there is an item you use consistently in the kitchen, stock up when it’s on sale. Dee and her family spent $238 this year to join a CSA (consumer supported agriculture group), but overall they felt it was worth the money to have fresh organic vegetables all summer long. When you are purchasing diabetic supplies like testing strips or meters, look for any company’s coupons. Most diabetes magazines have several coupons that you can use to save on your everyday supplies. Utilize sites like eBay, Amazon, and online medical supply websites. With most diabetic medications, there is an online medical supplier that sells it at a fraction of the cost. Brick and mortar stores are an option as well. You can also purchase medical I.D. bracelets and testing strips for much less online as opposed to your local pharmacy. First, if you have diabetes, do not assume that you can’t get life insurance. There is an incorrect myth in the diabetic community that states that if you have type 1 or type 2 diabetes, you cannot qualify for any life insurance. If you have dependents you will probably want to look into getting something like a term life insurance policy. Second, just because you’re a diabetic doesn’t mean you have to pay through the roof for your premiums. There are plenty of insurance companies that specialize in helping diabetics receive lower premiums for insurance. You rates will depend on your overall health, type of diabetes, and how well you are controlling your diabetes. Many diabetics may get standard rates if they are healthy otherwise. Are you looking for a quick way to save $40 a month? Cancel your gym payment. Exercise is important to managing diabetes, but you do not have to pay for a fancy gym to stay in shape. While all the machines might be nice, you can get the recommended amount of intense exercise by going for a jog or doing an in-home exercise routine. As with most financial situations, there is usually a way to spend less money. Keeping your eyes open to the possibilities and being willing to ask questions of your doctor and other diabetics will make sure that you or your loved ones are not overspending on anything needed to manage diabetes. Do you know anyone with diabetes? Do you have other ideas for ways for people with diabetes to save money? About the author: Paul Moyer is a proud husband and father of three young children. He blogs at SavingFreak.com about personal finance and how to save money on just about anything. Great tips! 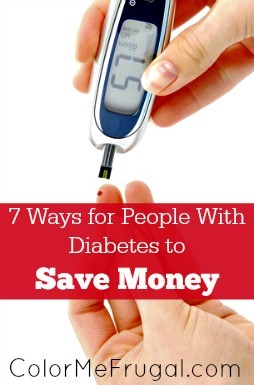 I’m a type 2 diabetic and I agree it can be very expensive but there are ways to save. Better management of your condition will not only save you in medication costs, but also in potential complications. I waited too long to take my diabetes seriously and ended up with heart problems as well. Another way to prevent complications is to take advantage of free or low cost screening visits such as eye exams. Finally, check to see if you are eligible for prescription assistance programs. There’s a list at Diabetes.org. Great tips Gary! I especially love the tip about taking advantage of free screenings when available! My father was a diabetic before, he spent much money for his medicines, that’s why he always told us before that we need to watch our health carefully. He was a big fan of using coupons before and he saved money from it. Wonderful tips, especially #1!!! We have several family members with Type 2 Diabetes, and as such we’re very careful to take prevention measures by way of a healthy diet and staying active. I’ve seen too many of our loved ones struggle physically, emotionally and financially due to this horrible disease. My father-in-law was recently diagnosed with type 2. Not a huge surprise, since most of his family has it and he’s pretty overweight, thereby upping the risk for it. My MIL has helped him decrease his sugar intake a pretty good amount, but he’s still not trying any sort of workout. And he knows that I — the gal with chronic fatigue — use short YouTube videos and would be happy to share them. Having been a lot more overweight in the past, I know it’s tough to get started. But I don’t think he’s ever going to take that step. Weight loss is a tough one for so many people. I feel for him and hope that he finds the motivation he needs to take action. Great tips! I can’t imagine how much money you’d end up spending on a chronic condition like diabetes. The samples are a great tip, but there’s gotta be a limit to how many of those are available. Yeah, I think most doctors will only give out samples for a few weeks or so of the medication. After that you’ll have to figure out how to pay for it on your own. Sometimes the pharmaceutical company will have coupons that you can use for certain prescriptions, though, and sometimes you can use those for up to a year or so.